The start of the season for Vulcan Men’s Basketball is particularly fresh this year. Sporting only three returners on their roster, the Vulcans added seven new members to their roster this offseason. All ten Vulcans saw playing time during their opening night victory 86-80 against Alaska Fairbanks on Veteran’s Day in the Civic Auditorium. The Vulcans were led by senior transfers Larry Bush and James Griffin each with 23 points apiece. Bush, a transfer from UNLV, was highly efficient shooting 8-11 from the field, including 2-3 from 3-point land, and getting to the line six times making five of his attempts, in only 20 minutes. 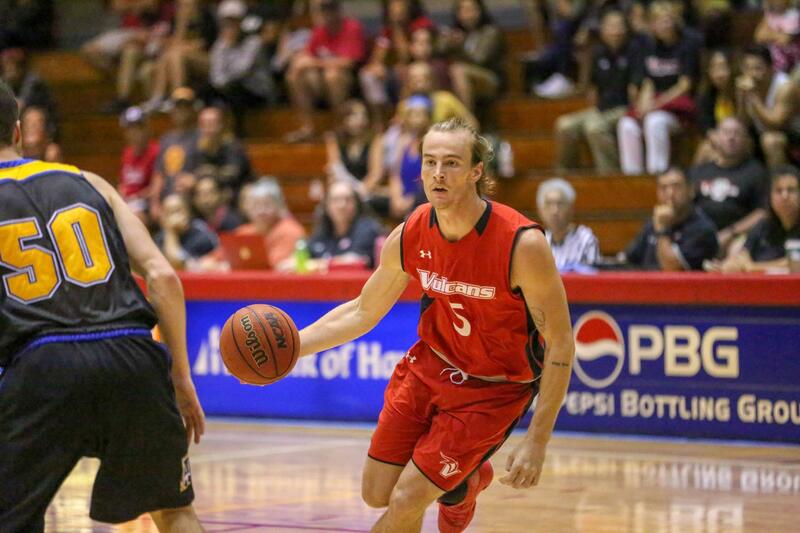 While this is considered something like a preseason for the Vulcans, who open PacWest play Nov. 29 against Hawaiʻi Pacific, the team demonstrated some obvious areas where they were successful as well as where they need to improve. The Vulcans were efficient from the field, making 54.2% of their shots, and sinking 6 of 9 attempts from deep during the second half after going 3 for 14 in the first. The Vulcans struggled at the free throw line making only 13-21 attempts, and were out rebounded 33 to 30, allowing Fairbanks player Michael Kluting to grab 16 boards. The Nanooks center finished with 33 points, 16 rebounds, and was sent to the line for 14 free throws. At times Vulcan center Denhym Brooke looked out of breath from the sideline. Early foul trouble from forward Devin Johnson forced Brooke to lead the team with 35 minutes of play time while trying to contain Kluting. The Vulcans committed 27 fouls on the night, allowing the Nanooks into the double bonus during both halves. The Vulcans look to clean up their game and continue their winning ways with two games against Simpson University Thurs. and Sat. at 7:30 p.m. at the Civic Auditorium.